The month of March marks the beginning of Spring. Interestingly, given one of the warmest winters on record, spring flowers have already been in full bloom. However, for investors, it has been a different story as volatile and declining markets have frozen many to inaction. Important Note: Speaking of weather, last year, the BEA adjusted the “seasonal adjustment” factors to compensate for the cold winter weather over the last couple of years that suppressed first quarter economic growth rates. (The irony here is that they adjusted adjustments for cold weather that generally occurs during winter.) However, the problem with “tinkering” with the numbers comes when you have an exceptionally warm winter. The new adjustment factors, which boosted Q1 economic growth during the last two years will now create a large over-estimation of activity for the first quarter of this year. This anomaly will boost the “bullish hope” as the onset of a recession is delayed until those over-estimations are revised away over the course of the next year. The problem is that the market, as of this morning, is struggling at minor resistance. However, if the markets can hold 1940, and work off the overbought condition to some degree through consolidation, then an advance to the current downtrend resistance at 1990 is entirely possible. In that same February missive, I noted three potential reflexive rallies based on Fibonacci retracement levels as shown below. 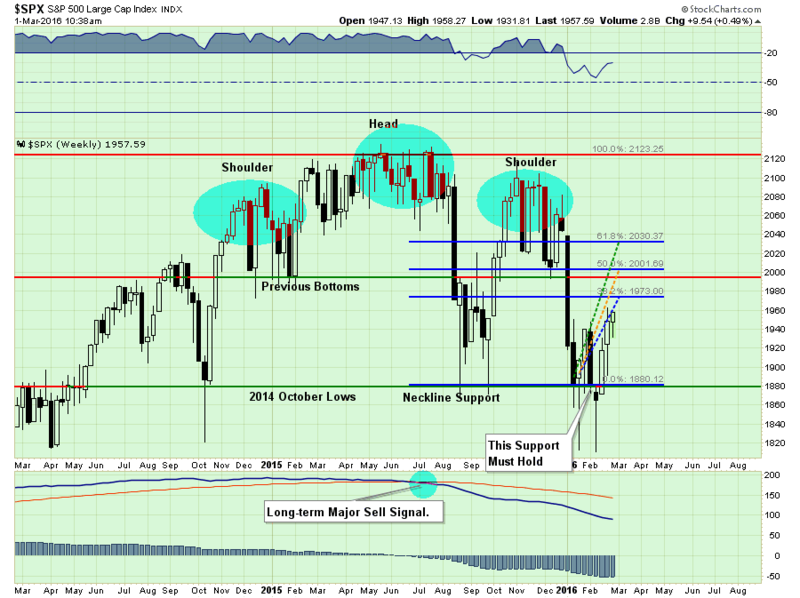 As stated above, if the markets can consolidate at the 1940 support level, a push higher to 1970 is entirely possible. Importantly, the trend of the market is still negative, therefore, all rallies confined within a negative trend should be considered “bear rallies” and used to reduce overall portfolio risk. For basketball fans, the month of March brings a lot of excitement as the NCAA heads into their annual tournament. Individuals that follow teams closely know all of the important statistics from win/loss ratios, player scoring, etc. all to derive the best odds of winning the bets they place. However, when it comes to the financial markets, most individuals simply “hope” that the month of March will yield positive results. I realize analyzing market data isn’t as fun as basketball teams, but since you are investing your hard earned savings, it is an exercise worth undertaking. So, let’s dig into the monthly statistics for March to get a better understanding of what we should expect. Beginning with the “big picture” perspective, the average and median monthly returns for March have not been terrifically exciting and only slightly better than what we would have expected for February. However, what averages and median returns obfuscate are the months when things go exceptionally well and horribly wrong. The next chart displays the best and worst return in March historically. While interesting, this still doesn’t tell us much about the month of March. For that, we need to view the entirety of March returns throughout history as shown below. What we now see more clearly is there are many times that March yields negative rates of return for the month. Since 1900, March has delivered 66 positive months and 50 negative months, giving March a winning percentage of 56.9%. Not much better than a coin toss. Yes, it is often the case that the month following a negative return month will post a positive return as markets bounce from oversold conditions. However, as shown below, this is not always the case. The chart below shows both February and March returns going back to 1957. During that period, the month of March has posted gains following a February loss 15 times, and losses following a February decline 13 times. Again, at 53.6%, the odds aren’t much better than a coin toss at best. One interesting note about the chart above is the sharp increase in monthly market volatility since the turn of the century as computers, online-trading, and algorithms took over the markets. Also, QE programs accelerated returns during the post-financial crisis period which has positively skewed the statistical analysis. At the time of this writing, the S&P 500 is currently up 25 points to 1957. This is not surprising given that this is the first day of a new trading month where institutions typically put money to work. However, as noted above, and shown below, the bounce in the markets is still confined to a very negative trend. All the signs of previous major corrective market tops are currently flashing which suggests that overall market action will remain under pressure. Such price action suggests that overall portfolio risk should be reduced to more defensive levels. This negative trend will eventually reverse, and when it does, it will be important to put cash holdings back to work. At such a time, the risk/reward scenario will be in a much better position to ensure longer-term gains. However, that time is not now.